1.5 How to control Tiles? Every time a user opens up a new tab in Firefox, the browser displays a number of boxes, or Tiles. 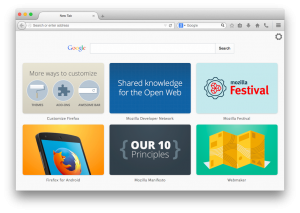 Frequent Firefox users see screenshots of the websites they visit most often in their Tiles. What appears in Tiles is currently based on “frecency” (an algorithm that combines your recency of visiting a site and your frequency of visiting a site). Sites that have been visited with the most recency and frequency appear in a user’s Tile. Default tiles and Enhanced tiles have been running for all current versions of Firefox and pre-release versions where Enhanced tiles are only visible to users who would have seen a history tile for that site in the new tab page. Suggested tiles are available to en-US Firefox 38 users and all Firefox 39 users where suggestions are shown if the user's top sites match a list of sites. NOTE: Information about the progress and plans for Tiles can be found in the Content services page. History Tiles are chosen based on the most-visited sites for a user. Only one tile from each domain is shown. New users to Firefox are given a set of tiles, default tiles, as suggestions for sites of interest until they generate their own history tiles based off their browsing experience. The list of default tiles given to new users is built from popular tiles and other tiles Mozilla chooses. Mozilla has support pages if you're looking to customize the new tab page, as well as a page that explains how tiles work. Firefox code related to the new tab page that powers Tiles. Onyx is a link server and engagement metrics aggregator for Firefox Tiles handling the delivery and receiving the metrics of Tiles via 3 data endpoints. Infernyx contains the rules to extract the metrics data and handles the immediate data processing of raw received data into aggregate data. Splice is our ingestion, validation, and authoring tool that makes sure tiles are processed, then published to the correct locale and country for Firefox users. It also contains the schemas for the metrics data. This page was last modified on 12 May 2015, at 22:40.